This section deals with "cosmetic" rust repairs, on panels that do not form part of the vehicles load-bearing structure. Any repairs to chassis, frame or mounting points of any type must be carried out to a professional standard, which is not the intended scope of this section. Rust repairs generally cover two areas; surface rust and rust holes (perforation ) Surface rust can usually be removed and held at bay successfully, perforated metalwork will need much more extensive work to provide a lasting repair. 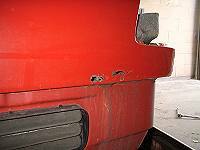 Where surface rust and pitting is evident, additional stages to the normal sanding/feathering process are required. Use a wire brush attachment or "flap-wheel" type flexible abrasive to completely remove any trace of corrosion from the pitted surface, paying careful attention to seams and out-of-sight folded edges, to prevent rust creeping around door edges, etc. When perfectly clean, treat with a proprietary rust remover surface Rust spotstreatment. Apart from the range available in motor accessory shops, paint suppliers also supply metal conditioning/surface treatment fluids which are usually phosphoric acid based. Whichever type is used, follow the manufacturers' instructions, rinse thoroughly and dry the metal immediately. Follow this with etch primer before any further filling of minor surface defects is attempted. Note: etch primer should not be used as a base for polyester bodyfillers. Use a primer-filler followed by a stopper intended for use on primers. More serious rusting can lead to obvious holes in the metalwork, or as often happens in double skinned areas such as rear wheelarches or door bottoms, rust or blisters which appear because the panel has rusted quietly away from the inside. By the time the first signs show, the metal in that area is already beyond help. The only long term repair will involve a panel\section replacement, or if the area is very small and the rest of the panel is absolutely sound, body solder can be used effectively. For a purely cosmetic temporary repair, the affected area can be sanded back to bare metal and the rusted area tapped in with a pointed hammer. This will in all probability produce some spectacular holes, which must then be filled with a glassfibre paste before final finishing with bodyfiller. Bodyfiller on its' own is porous and not recommended. Sand to shape and finish as described n the "Using Bodyfiller" section. Even using glassfibre as a base, moisture can still attack the metal from the underside, so this can only be considered a temporary repair which should give a few months reprieve. If possible coat the underside of the repair with a wax based antirust coating, such as Waxoyl.